Morrowind, the third Elder Scrolls RPG, has a rich and somewhat complicated story. Luckily, now we have a Facebook timeline to simplify it all. Humorously. 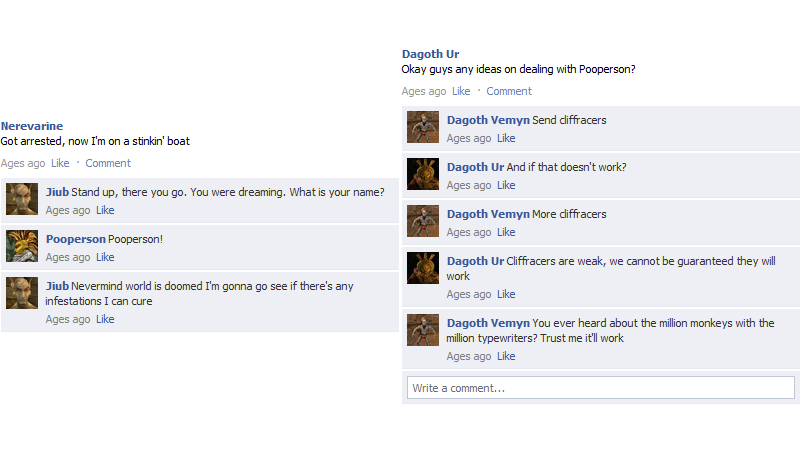 It was whipped up by redditor TheTitanova, using this Facebook wall generator, and posted to r/morrowind last week. Basically, it’s a cleverly written account of the backstory and the in-game events of Morrowind—it starts with the creation of the Tools of Kagrenac way, way before the player character’s time, and concludes with the events of the game’s ending (with some post-ending bits thrown in).